Tallahassee Mayor Andrew Gillum defeated former Rep. Gwen Graham. "Whoever thought this was possible?" Gillum asked the crowd of supporters at his victory party in Tallahassee amid chants of his campaign slogan, "Bring it home." "This thing is not about me," he added. "I sincerely believe what will deliver us victory in November is that there are everyday hard working people in the state who believe that they deserve a voice in our government, too." "[Gillum] is the son of a school bus driver and construction worker and those experiences shaped his vision for Florida," said Democratic Governors Association Chair Gov. Jay Inslee, D-Wash., in a statement. "After eight years of failed leadership, Andrew Gillum’s bold new vision makes him the right leader to make progress for Florida." Gillum, a 39-year old African-American boasting a progressive agenda along the lines of Sen. Bernie Sanders, the Vermont Independent, and Alexandria Ocasio-Cortez edged out frontrunner Gwen Graham in a crowded five-way primary for the historic win. 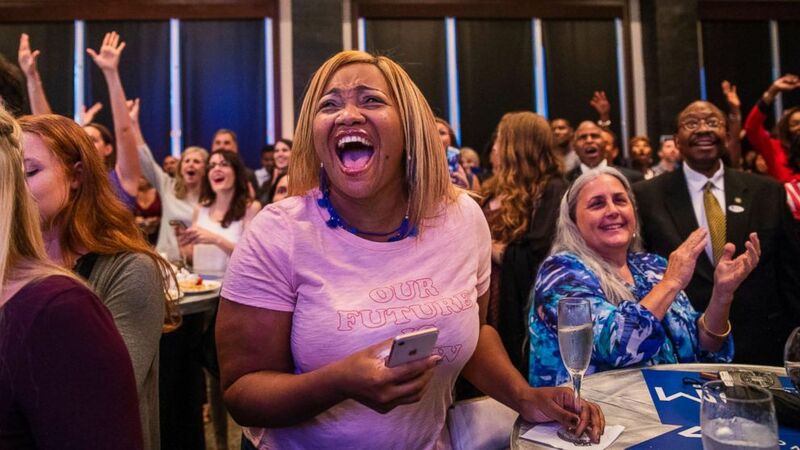 (Colin Hackley/Tampa Bay Times via ZUMA Wire) Dr. Atira Charles of Tallahassee, center, reacts to early results showing Andrew Gillum closing on Gwen Graham in the race to become the Democratic candidate for governor, during the Gillum for Governor election watch party, Aug. 28, 2018, in Tallahassee, Fla. If elected in November, he would become the first African-American governor of Florida. Sanders tweeted his congratulations, saying, "Tonight, Floridians joined Andrew in standing up and demanding real change and showed our nation what is possible when we stand together." Surging in the final weeks leading into the primary, Gillum's clinching the nomination suggests that the "blue wave" is trending even bluer in 2018. His grassroots campaign mirrors that of Ocasio-Cortez, whose takedown of New York City goliath Rep. Joe Crowley sent shockwaves through the Democratic Party earlier this year. Graham, an establishment candidate and member of a Florida political dynasty -- her father Bob Graham was once the state’s governor and U.S. senator -- appeared to be a more centrist candidate who could appeal to independent voters in one of the most closely-watched gubernatorial races this cycle. Graham also shared her support for Gillum in a tweet, writing, "I’ve pledged to do everything I can to help Mayor Gillum defeat DeSantis in November." Late in the race, the left rallied around underdog Gillum and he began to chip away at Graham’s lead, eventually overtaking her family's political legacy late Tuesday night. Quick to respond to his victory, the Republican Governors Association released a statement from Communications Director Jon Thompson that said: "With Andrew Gillum, Florida Democrats have selected a radical far-left politician who remains at the center of an FBI anti-corruption investigation." "On top of the cloud of corruption surrounding his campaign, Gillum supports radical far-left policies like Single-Payer health care and massive tax hikes that would kill jobs and decimate Florida’s economic progress. Andrew Gillum can’t be trusted to be honest or lead Florida forward and will be soundly rejected by voters this November," the RGA statement said. Gillum’s campaign has been the subject of an FBI investigation, after agents subpoenaed "thousands of pages of from key players in city government," according to the Tampa Bay Times. The Times also notes that Gillum has not been "named in any subpoenas." With the cloud of a federal investigation over his bid for governor, Gillum faced an uphill climb to advance to the fall’s general election. "All indications are that we are going to have an usually high turnout at least in recent years," said Michael McDonald, a political scientist at the University of Florida. This momentum behind Gillum's win could also energize Democrats across the board in the general, and could boost support for Sen. Bill Nelson, who is defending his seat against Republican Gov. Rick Scott. 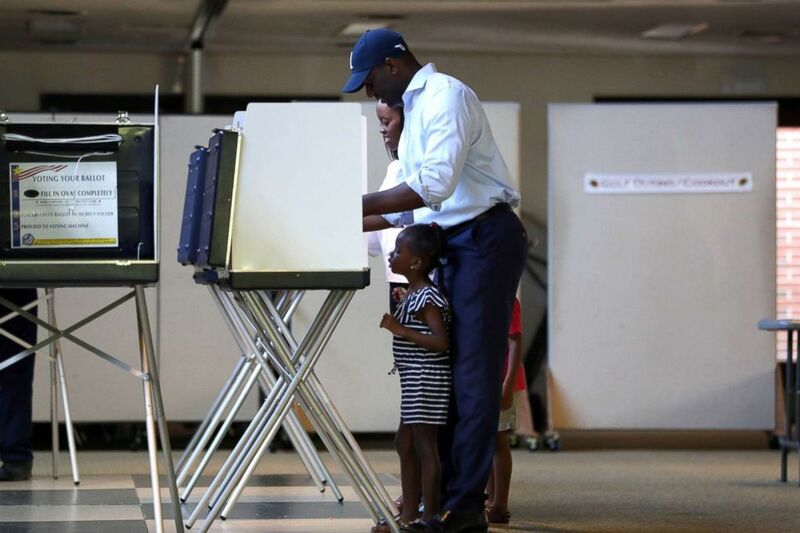 (Joe Rondone/Democrat via USA TODAY NETWORK) Florida gubernatorial candidate Andrew Gillum casts his vote, with daughter Caroline, 4, by his side at the Good Shepherd Catholic Church polling location, Aug. 28, 2018, Tallahassee, Fla.
"This is a historic evening for Florida and it’s clear that voters across the state are engaged in this election, reflecting the enthusiasm we’ve seen around the country," Nelson said in a statement. "The stakes could not be higher. What’s at issue is the quality of our public schools, and access to health care and cleaning up the green slime fouling our waterways." "We've been on this campaign trail for 18 months, and I've said numerous times that there would never be a poll showing the mayor winning this race until tonight," Andrew Gillum's communications director Geoff Burgan told ABC News' Tom Llamas and Rick Klein. "And here we are." "This is our moment," Gillum asserted Tuesday night.